PlanetSKI arrives in a country it's been wanting to ski in for years. To say we're excited is a bit of an understatement. I've clocked up hundreds and hundreds of ski resorts across the world in my travels (600+ at the last count), but for some reason I've never skied in New Zealand. That is about to be put right. I have two weeks ahead of me in New Zealand and then a month in Australia. The first week in New Zealand will be spent in this fellow touring the South Island and its ski resorts. And the freedom an RV gives you is demonstrated immediately. There a competiton going on with serious GB interest so I'm heading there instead of a pre-booked hotel room. And then there are the glaciers too. And who knows, maybe a bit of heli-skiing if the conditions are right and the wallet allows it. 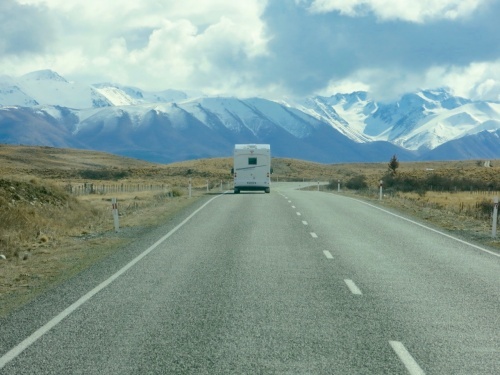 Then it's probably up to the North Island, but plans are deliberately loose as flexibility and ‘making-it-up' as we go along are key to all good ski road trips. Regular readers will know I set off from the UK over a week ago and have taken the slow route here via Dubai, in the United Arab Emirates. And lastly Melbourne for a day, where I had a quick tourist tour of the city. And what did I pack for such a trip with more than 2-months on the road? I'm back in Melbourne in a couple of weeks after NZ to see more and visit some of the nearby ski areas before heading up to Perisher. But that is to come. My thoughts now are in New Zealand and the coming two weeks. Snow conditions Down Under this year have been excellent with some of the best snow in recent memory in both countries, as we have been reporting lately on PlanetSKI. Is it worth coming all this way to make some summer ski turns?